This is one of the two Flying Js along I40. This nice one at Tucumcari, exit 333, has a nice exercise area. 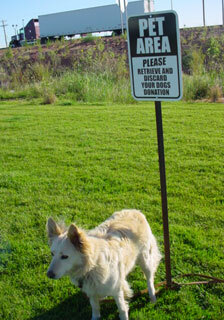 If you can't read the sign; "Please retrieve and discard your dog's deposits." There are other rest areas just didn't take any pictures.